The Presbyterian Church of the Mountain Cuba Team poses with some Cuban hosts during its recent trip to Cardenas. 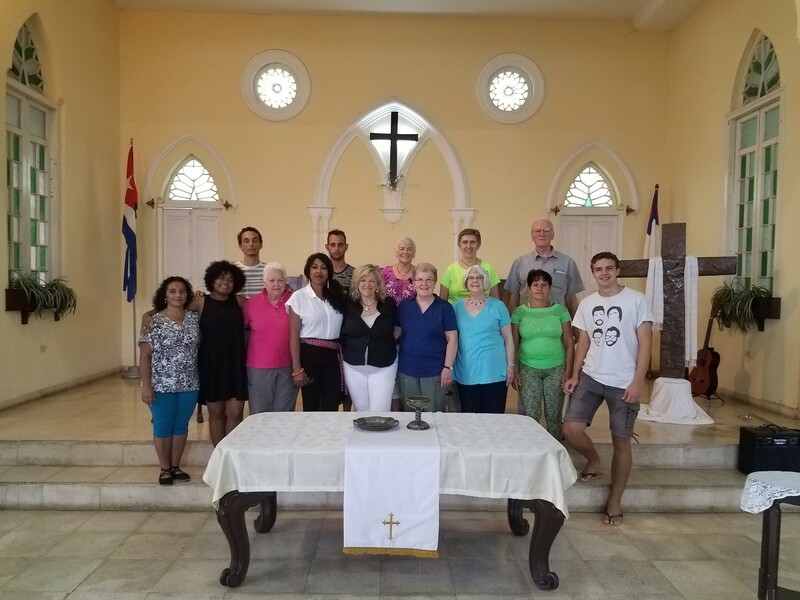 The Presbyterian Church of the Mountain in Delaware Water Gap, PA (Lehigh Presbytery), with the help of a $4,000 Mission Travel Grant from the Synod of the Trinity, sent a mission team comprised of eight parishioners to Cardenas, Cuba, from May 8-15, 2018. This was the eighth mission trip since 1998 that the PCOM has made to Cardenas. The team carried with them more than $40,000 worth of medicines that they donated to their sister church in Cardenas, the Juan G. Hall Reformed Presbyterian Church. This mission began 20 years ago when the PCOM decided to donate medicines to Cuba after learning of the shortages there created by the U.S. embargo. A three-member mission team carried medicines, obtained from MAP International, to a church they learned about from a local pastor who had recently visited it. The personal and spiritual relationships that were created during that first visit have grown stronger over the past two decades. In addition to returning to Cardenas seven times since then, the PCOM has brought Cubans to visit the Water Gap church on two occasions. Also, Pastor Alison Infante Zamora of the Juan G. Hall church visited the PCOM in the summer of 2017. Within three days of first arriving in Cardenas in 1998 it became clear to the first mission team that, while the medicines we were carrying were a valuable contribution to the people of Cardenas, the relationships we were forming were more important. When we returned two years later we were told how important it was that we returned. 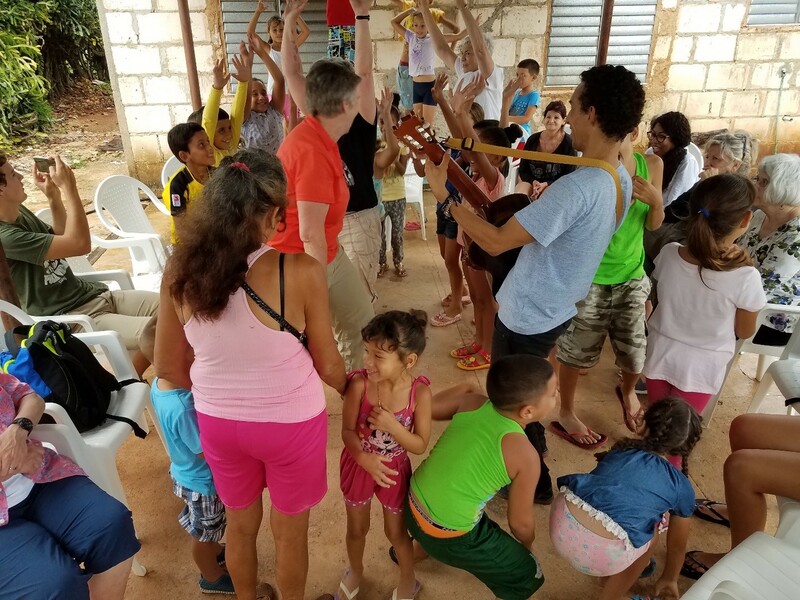 Since then, the primary contribution of these trips — the central focus — is the relationship that has developed between the people of the Juan G. Hall church and the people of the PCOM. In order to maximize the opportunities for person-to-person contact, we have endeavored over the years to bring some Cubans to our community in Delaware Water Gap. Recent developments in Cuba involving the U.S. government makes a trip by Cubans to visit us in the near term difficult. Things will change, however. Bringing Cubans to the United States for a visit serves to break down walls between our countries. It also serves to create enthusiasm in the congregation of the PCOM for the Cuba mission. On its trip to Cuba, the mission team helped out with the Living Waters project, which provided pure water for the neighborhood. In addition to approximately $39,000 worth of medicines obtained from MAP International, the 2018 mission team took additional medicines donated by the PCOM congregation and by a local physician. We gave those medicines to the church in Cardenas, where two members of the congregation who are physicians will oversee their distribution to local residents. While the team was in Cardenas they participated in the weekly activities of the church. Cardenas is a city of 120,000 people. Some elderly parishioners struggle to make it to church on Sunday morning, so smaller worship communities, called Pastorals, meet weekly to serve them. Members of the mission team participated in these worship activities in homes throughout the city. Team members also visited and dined with parishioners in their homes. One of the team members was the pastor of the PCOM, the Rev. Sherry Blackman. Pastor Blackman took a prominent role in the mission, offering multiple prayers and giving the sermon at the Sunday morning church service. Of the eight team members, four were musicians. Individually and together with Cuban musicians they contributed to the rich musical component of the trip through their performances. Other team members contributed in their own, unique way to the success of the trip. Through daily contact with the Juan G. Hall congregation in their homes and in the church, team members learned of the hardships and challenges faced by Cubans on a daily basis. Food shortages are endemic. Many homes are crumbling around their owners because of the lack of building supplies or the lack of money with which to buy supplies. (One of our friends has to sit up at night when it rains because the roof leaks on her bed.) 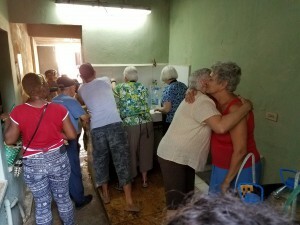 While the Cuban government offers excellent – and free – medical care, medicines, medical supplies and medical equipment remain difficult to get. Perhaps the most sobering reality for Cubans is the lack of opportunity for young people. We have friends who, because of Cuba’s free higher education, have degrees in engineering and other professional fields, yet who work in the tourism industry because doing so gives them access to foreign currency through tips. Hope is in short supply. Pastor Alison Infante Zamora of the Juan G. Hall church leads the singing and controlled chaos. Yet, the members of the Juan G. Hall Church in Cardenas maintain a positive and happy attitude. Of the lessons we learned on this trip, perhaps the most important was that material wealth is not a prerequisite for happiness. In the past, the PCOM has sent a number of teenagers to Cuba as part of the mission. Looking forward, we would like to send a teenager to live for a month or more with our Cuban friends in order to strengthen the bond between our churches. The Gospel of Jesus Christ is for all nations, for all tribes, for all peoples of every language. Being in Cuba enriched and expanded our understanding of the universality of grace, as well as what it means to be kindred spirits, experiencing what holds us in common is far greater and more manifest than any of language or cultural experiences.